Sponsorship is now available and company logos and/or names will be included on the Brochure if received prior to printing which is scheduled for March 2019. 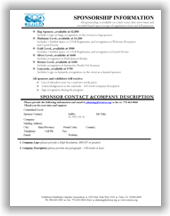 To sign up as a Sponsor and to be listed on the brochure, please complete the Sponsorship Company Information Form or Sponsor Online Registration Form. If you have any questions or need additional information, please email events@swmoa.org for assistance. All sponsorship is available on a first-come, first-serve basis and recorded based upon receipt of registration form and full payment. Current Issues Impacting Local Membrane Utility Agencies, Maximizing Recovery, Concentrate Management, Operator Roundtable Discussion, Case Studies, Lessons Learned, Facility Tour(s), and more. All sponsorship is available on a first-come, first-serve basis and recorded based upon receipt of full payment. Included in the sponsorship package. All Exhibitors must have company membership (not individual membership with SWMOA). Allocated on a first come/first serve basis upon receipt of 10% deposit. Deposit fee must be paid by April 19, 2019 and full payment due by May 17, 2019 or deposit and booth space will be forfeited. Included in the exhibitor package. If paying by check, make payable to: Southwest Membrane Operator Association, and mail to: 1035 E. Vista Way. #103, Vista, CA 92084. Written cancellation requests received by SWMOA on or before April 16, 2019 will receive a refund, less a 25% processing fee. Full payment is required if cancellation is received on or after April 17, 2019 - no refunds and no credits for future events will be granted. However, substitutions may be made at any time. SWMOA reserves the right to make changes in programs and speakers, or to cancel programs when conditions beyond its control prevail. Every effort will be made to contact each enrollee if a program is cancelled. If a program is not held, SWMOA’s liability is limited to the refund of the program fee only. toward the scheduled event.